This chart is an interesting snapshot of American financial history. 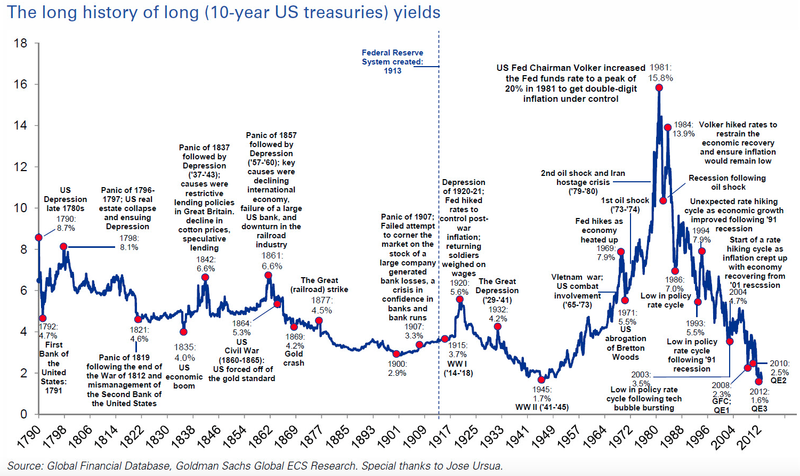 It shows the interest rates on U.S. Treasury bonds from 1790, when they were first issued at a rate of 8.7 percent, through the third quarter of 2012, when they were at an all-time low of 1.62 percent. As of this morning, the 10-year Treasury yield is 2.26 percent. Why would people lock in their savings at such a low interest rate? If they are foreigners, it could be because they have more confidence in the value of the U.S. dollar than they do in their own currencies. Or it could be that they fear another financial crash that would wipe out the value of most stocks and bonds. This entry was posted on November 16, 2015 at 7:34 am and is filed under Economy, History. You can follow any responses to this entry through the RSS 2.0 feed. You can leave a response, or trackback from your own site.